From the kitchen of One Perfect Bite...It's not the prettiest yellow in the garden but it is arguably the tastiest. 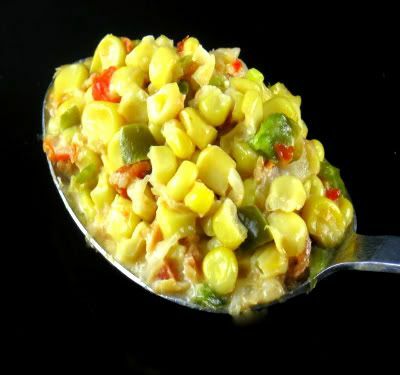 I first had corn maque choux years ago and have been a fan of it ever since. Back then the vegetables were softened in bacon drippings and the corn simmered in a bath of heavy cream. Today's recipe is a healthier version of that dish and nearly as good. While the recipe is delicious made with fresh corn, I use frozen shoepeg corn to simplify things. The tender kernels are small and white and have a remarkably sweet flavor. I'm told that in the south it's also called country gentleman corn. It is wonderful in Cajun corn maque choux. The dish comes from southern Louisiana and it's thought to be fusion of French and native American cooking. I like to serve this with plain broiled chicken or grilled steak. Take a peak at the recipe. I think you'll enjoy this. 1) Heat oil in a large skillet over medium heat. Add onions and peppers; cook until onion is translucent, about 6 minutes. 2) Add corn, tomatoes, pepper flakes, salt and pepper and toss to combine. Add milk and cook until corn is soft, about 10 minutes. Stir in bacon. Transfer to a serving bowl. Pass hot sauce at table. Yield: 6 servings. It is also be linked to Tempt My Tummy Tuesday and Tasty Tuesdays. This looks yummy. I love your pretty pix and your recipes, especially those not-too-sweet desserts. And thanks so much for visiting. Ahhh! Fresh corn tastes great! Why do I always feel hungry when I visit your blog? One of my favorite dishes is corn on the cob. I am sure your is delicious. Makes me hungry just looking at the picture. I bet you are a wonderful cook. Oh heck i would of never thought about corn, great choice. They look scrumptious, now I need to visit my local farm to buy some, local corns are the best. hmm... yummy! 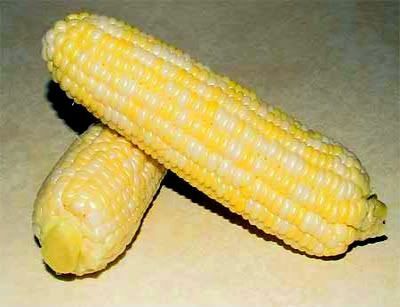 i miss yellow sweet corn on a cob. grilled please! happy monday! i love the idea of this side dish, and i love the idea of NOT braising it in bacon fat/butter! Mmmm, corn and bacon. Be still my heart....and stomach. I cant wait till we start getting corn. There is a corn that they had last year that was early and it was oh so tastey and sweet. I want to say this is the same one but now I have to check with them when they start selling it. That corn on the cob looks soooo good. I've never seen cotc in a mixture of yellow and white. I'll need to check around here and see if there is any available. That looks so delicious and it has bacon in it too !! The sweet corn has been so good this year. I can't get enough. Will give this a try. Thanks for the recipe and the visit to my site. I come from a place that is famous for its corn, so I have bookmarked this recipe to try - looks amazing! Enticing! I think I'd use 1/2 cup each of red and green bell peppers, but I like LOTS of color! Looks great. My 2 year old daughter LOVES corn! Thanks for sharing your recipe and joining us for the TMTT anniversary today. Cajun Corn sounds great! I love anything with bacon thrown in. Yummy. That looks and sounds amazing.